Feed a Smile: The meals for the first day are guaranteed!! It is still one week before the event will start and we already can feed the children for one day. While I am writing this we have a total of 503 meals. This is great and we thank all sponsors and donors for they're eagerness to help. 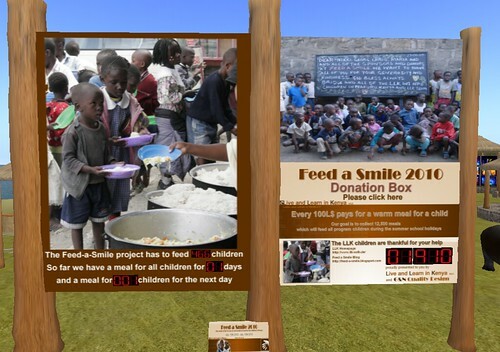 Every little bit is importend and we are happy for every donated Linden no matter if it is a 1000 or 1 Linden. An extra thankyou to Swaffette Firefly of SF Design for going that extra mile with promotion of this event, your extra work has brought extra meals. Thanks again on behalf of the LLK children to all sponsors, donors and the many helpers behind the scenes.